MEAP's are going to be the new *aaS. If you don't understand that statement, consider yourself blessed. You may feel like you need a computer forensics degree to understand it all. Understanding technology industry analysts and acronyms is a difficult task. A relatively new category of Gartner Magic Quadrants have emerged one one in particular is a category that we think deserves a lot of attention. Mobile Enterprise Application Platforms are not typical software like your daddy used to buy. MEAP's are collections of services and components (including frameworks, profiles, libraries and more) that facilitate the types of functionality required to develop and maintain applications running on wireless devices (aka mobile devices). Now I don't subscribe to hype and BS and neither should you. As the former chair of the OASIS Service Oriented Architecture Technical Committee, the group that produced the standard reference model for SOA, I never anticipated that people would run with this and start all these (INSERT ANY CAPITAL LETTER FROM THE ALPHABET HERE)aaS. Software as a Service (SaaS) is not really that different from hosted solutions is it? If you disagree, you'd better hurry and claim one while there are still letters left for acronyms. I think XaaS is not used yet. When I see value though, I want to point it out. MEAP is one of those rare acronyms that seems to be vastly underestimated by the majority of the industry. The term itself seems to have come from Analyst firm Gartner in a paper published in April 2011 (Gartner, Magic Quadrant for Mobile Enterprise Application Platforms, Michael J. King, William Clark). I believe I read somewhere that Gartner believes over 95% of the technology industry will use some form of MEAP by 2012. When I try to research this topic on Google, very little information comes up. Regardless of the title, let's explore what a MEAP is and what it does. According to Gartner, using a common mobility platform, like a MEAP, brings considerable savings and strategic advantages in this situation. Mobile Device Management (MDM) - manages, monitors and secures distrubuted mobile environments. Multiple Message Exchange Patterns such as Push Notifications that are respect end users data plans and battery life. Advanced Security Features such as remote session management and data wipes. These are sometimes viewed as part of MDM. Mobile Payment Gateway Services - services that can access a Merchant Processing Account and extend that functionality via the MEAP to the mobile environment. Data Synchronization when mobile devices become re-connected to networks. Data Transformations to facilitate existing data being marshaled into formats that are optimized for mobile such as JSON or even HTML5 for mobile websites. Data Persistence usually on both the mobile device and the server side. This is by no means an exhaustive list of items. Uberity will be writing some more about this topic in coming weeks. It is clear to use that some, if not all of these components, will be of interest to a large number of customers. One last word. I don't want to ever see someone pitching "MEAPaaS" but sadly I know it will probably happen. At the risk of being sued myself, I find I have to really speak out about this news story. Found on SlashDot and after some research, it appears that Michael Doyle and Eola Technologies are suing what will inevitably be any one who uses the internet or deploys a networked coputer product. He is seeking royalties for the use of just about every modern interactive Internet technology, like watching videos or suggesting instant search results. Michael and his company formerly sued Microsoft and won a $521 million lawsuit after successfully claiming that their Internet Explorer browser infringed one of his patents. Hey Michael! Guess what? No one likes patent trolls. On top of that, I am pretty sure that the DarpaNet founders as well as Tim Berners Lee may have something to say about this. In fact, I would be totally willing to testify about a pre-IP/TCP program I wrote back in around 1980 that enabled two computers to communicate using 600 baud modems, 7 stop bits and half duplex. Mr Doyle's lawsuit is rumoured to claim he created a program to view embryos online. He furthermore claims this was actually the very first program which allowed users to interact with images inside a browser window. In my opinion, if you abstract "browser" to a "graphical rendering tool that parses and interprets bytes into one or more interactive graphic user elements", then I also did this (albeit prior to streaming video) in about 1984 using GWBasic. This also passed very rudimentary images over a network and changed the images at a rate of about 3 per second, creating the illusion of a crude video. If Michael wins, I will certainly be calling up my old Computer Science professor Mr. Langston and a few former friend who can document this. 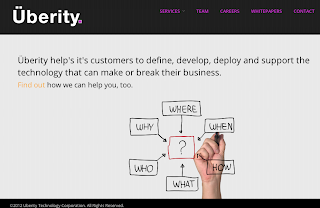 Today Uberity Technology Corporation officially opened the doors for business and launched it's website. Since leaving Adobe, I have been blessed to get back together with the best developers and engineering staff I have ever worked with and start building the technology we think will help enterprises transition to extend their IT systems to the mobile space. Uberity's mission is to help's it's customers to define, develop, deploy and support the technology that can make or break their business. One of the first offerings we are releasing is a free White Paper on Enterprise Mobile Application Development Strategies. This is a pragmatic look at the challenges facing executives and managers who are responsible for their companies long term mobile development strategies. Most of the content of this white paper comes from learning the hard way what does and does not work for mobile application development strategies. There are plenty of options from cross compiling to running through an intermediate interpretation layer to developing natively for each stack. This White Paper explores the key considerations along with the strengths and benefits of each approach. More will be written on this topic later. Another area we are working within is Adobe LiveCycle ES and Data Services. Uberity employs several former Senior Adobe Engineering staff who worked on the core LiveCycle platform. Along with myself, we feel we have a team that is skilled and capable to take on any LiveCycle work. Uberity has recently successfully completed some LiveCycle Professional Services work and is open for business to hear your needs. With a combined experience of over 32 years of LiveCycle expertise, our team is ready to take on new challenges. If interested, contact duane at uberity dot com. Another area we are building out is a health care solution based on using Neo4J as a graphDB back end to integrate mobile functionality. This project is built using our modular approach to enterprise architecture and the core patterns we have implemented can be used for other verticals as well. On a personal note, this is the most exciting thing I have done in technology for years. We've already closed a lot of business and are hungry for more.